The food revolution has officially come to the Venice Boardwalk! Top quality, massive variety, great prices, and all the convenience of a walk up window with an outdoor patio is what you get at the newly remodeled 19th ave. Food Court on the World Famous Venice Beach Boardwalk. 1827 Ocean Front Walk. Venice, Ca. 90291! How about we start with legendary local sushi chefs Carlos Hernandez, formerly of Chaya Venice, and Renee of Canal Club fame, serving up ultra fresh, delivered daily, sushi and poke’ at Sushi Venice. Then add real deal, authentic, street tacos to the mix at neighboring Taco Venice. The marinated steak, carnitas, fish, and spicy shrimp are all damn good, and made fresh daily, as is the guacamole. Feeling Vegan? Try their scrumptious sweet potato or mushroom tacos. And it does not end there, there is more next door! Throw in freshly roasted, grass fed, lamb and free range chicken gyros at everyone’s favorite Greek food spot, Malaka Brothers! Add in their fresh, cut to order fries, and homemade falafel and you have something for everyone! But we are not done yet. Right around the corner are organic smoothies and fresh pressed juices at Muscle Beach Juice Bar. Their made to order smoothies and juices are created with freshest ingredients and best supplements available. They are a fantastic choice pre/post workout, or anytime for that matter. Get your A game on! See you at the 19th Ave Food Court on the World Famous Venice Beach Boardwalk! 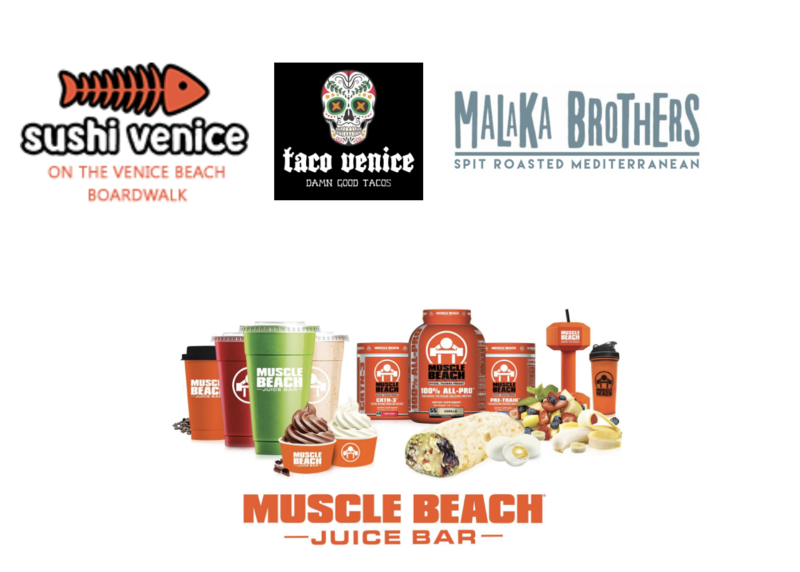 Robust flavors of Mediterranean cuisine prepared to perfection and served at the 19th Ave Food Court on the World Famous Venice Beach Boardwalk. At Malaka Brothers Spit Roasted Mediterranean we only use the finest Free-Range, Antibiotic-Hormone Free, Grass-Fed Lamb and Chicken. Seasoned to perfection, and spit roasted fresh daily. We make our hummus, eggplant, tzatziki, tahini, and garlic sauces in our kitchen daily from traditions old Greek Family recipes. Once you try our food and taste the difference you’ll know why people worldwide keep coming back to Malaka Brothers for the best Gyros in Los Angeles, conveniently located next to Muscle Beach on the World Famous Venice Beach Boardwalk! Malaka Brothers is located at the 19th Ave Food Court. Sushi Venice was opened to change the way people think about boardwalk food. Exceptional taste and quality paired with a fun and friendly environment, working with locally sourced ingredients, sustainable fish, made fresh to order for our guests. Our mission is to provide the best sushi and poke available in the most unique setting in Los Angeles – Venice Beach Boardwalk. Sushi Venice located at the 19th Ave Food Court. View Sushi Venice’s menu below. At Taco Venice we only use the finest Free-Range, Antibiotic-Hormone Free, Grass-Fed Beef and Chicken, sustainable seafood. Seasoned to perfection, and cooked fresh daily. We make the salsas in our kitchen daily from traditions old Mexican Family recipes. Once you try our food and taste the difference you’ll know why people worldwide keep coming back to Taco Venice for the best Tacos in Los Angeles, conveniently located next to Muscle Beach on the World Famous Venice Beach Boardwalk! Taco Venice located at the 19th Ave Food Court. View Taco Venice’s menu below!